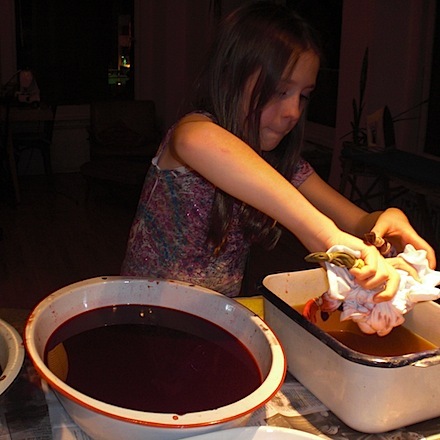 You may be thinking, "who in their right mind would let kids do tie-dye in their apartment?" Well, you may have a point. If you have outdoor space or the weather is warm, the actual dying could be done outside, but you can also just put down a plastic tablecloth on the floor or kitchen counter, add a layer of newspaper to absorb spills and let them go to town. White T-Shirts (two or three per child is ideal). You can also invite them to bring other white items if they want. It's a great way to improve corny logoed or printed shirts. They look much cooler once tie-dyed. Rubber Bands - Wider ones are better. RIT Dye - If you get blue, red and yellow you can double dip to make green and other colors, but black and other colors can also be fun. 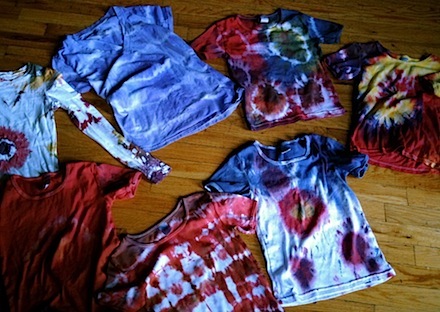 The only thing you really need to know is some basic tie-dye patterns. This website has helpful videos that show you how to make some different tie-dye designs. Depending on the age of your children, you can either show them the videos to follow or show them pictures of different styles and just help them prep their t-shirts. 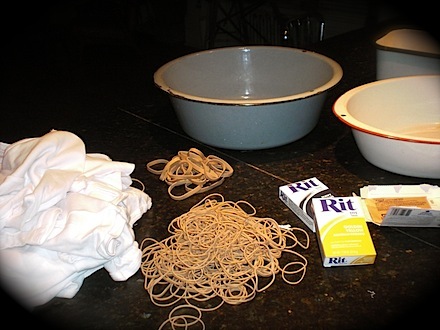 If you have a dryer in your apartment or building, toss the shirts in the dryer when all the kids are done so that they will be dry after cake for the kids to take home as party favors. More ideas: If you want to get fancy you can preprint the t-shirts with the birthday child's name and date, or another design to commemorate the party, using iron-on transfer paper. Or you can give the kids sharpies and let them decorate their shirts before dying or after drying. For younger kids you can put dye in squirt bottles and they can just spray the shirts. You can make a tie-dye cake using food coloring to pattern a white frosted cake. Use Scratch Art Paper to create invitations, as another arty activity or for party favors.